Verbs and nouns are elementary notions in linguistics, so the question how children learn to categorize verbs and nouns in their first language is an intri­guing one. Children not only have to learn to identify verbs and nouns as be­longing to different categories based on perception, they also have to learn what verbs and nouns are using them in an adult-like manner. This book in­vestigates when and how Dutch children are successful in these two tasks by means of production and perception studies. An analysis of corpus data shows that Dutch children use verbs and nouns in an adult-like manner from their earliest combining of words onwards. Two­year-olds know that verbs and nouns are used differently in sentences and are able to use this knowledge. Two perception experiments using the head-turn preference procedure confirm that children are able to categorize verbs and nouns at an early stage. Dutch 16-month-olds were trained on nonsense words embedded in contexts in which verbs and nouns frequently occur in child-directed speech. They were able to categorize the nonsense words if the contexts were local enough. 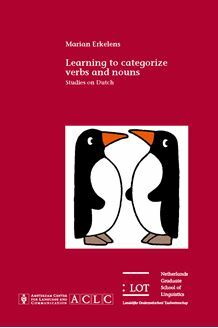 Frequently co-occurring bound morphemes provide such a categorizing context for Dutch, whereas frequently co-occurring words do not. Dutch is different in this respect to English. The conclusion of this study is that categorization of verbs and nouns starts very early in language development. It is based on the perception of category­indicative properties but these differ across languages.